Only a few days after I wrote my last post outlining what I'd like to achieve with my knitting this year I've wandered off-course; I'm pottering around. I've begun to knit a cardigan for a baby who's the first grandchild of a very old friend. This certainly wasn't on my list of things to knit this year, but baby knitting is always seductive and this particular pattern has lots to recommend it. 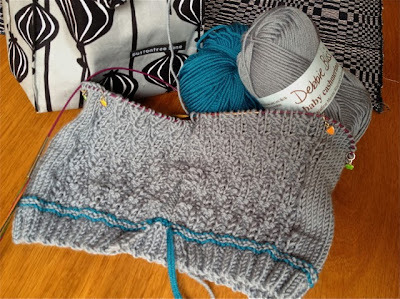 I'm knitting the MacDougal Cardigan - a pattern by Connie Chang Chinchio who's a well-known and admired knitwear designer who has published several patterns for babies and children since her daughter was born a couple of years ago. I like the fact that she brings the taste and technical knowledge developed through years of designing adult garments to her children's patterns. In this particular cardigan I like the combination of the rather retro oat-stitch patterned panels on the front of the cardigan with its practical boxy shape and the unfussy contrast trim of reverse garter stitch. In my defence of pottering away from my year's plan I can add that I used yarn I already had (some grey Debbie Bliss Baby Cashmerino) and the pattern does include useful knitting skills such as a three-needle bind-off at the shoulders and the option (which I shall take) of knitting the sleeves by picking up stitches around the armhole and knitting them in the round. I'm a bit doubtful about the colour. I think a grey cardigan is very useful for a baby, but I know not everybody shares my belief in grey as suitable for all ages and occasions. Let's hope the cuteness of the pattern compensates for the rather utilitarian colour. 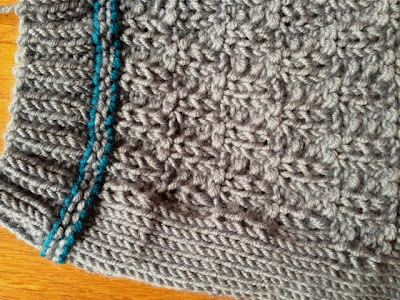 I've been putting off writing this post because I'm rather embarrassed by the paucity of my knitting output in 2013. Only eleven completed projects, which is significantly fewer than the sixteen items of 2012, and that in turn was fewer than 2011. A definite downward trend and rather pitiable compared with some of my knitting friends. (See, for instance, the amazing output from MissFee who proves the adage of already busy people being the most likely to achieve additional tasks). Still, I've decided to continue the blog tradition I seem to have established of awarding prizes for my year's knitting. At the very least, this makes me reflect on which items of knitting have worked in various ways. First, the award for the project of which I'm most proud. This goes to my Northmavine Hap, made to Kate Davies' impeccably written pattern from a mixture of beautiful Shilasdair yarn and destashed Isager yarn. I'm proud of this mostly because I persisted with it, and persistence is not a quality I often exercise with my knitting. I had several false starts while I tried to find the perfect pattern for the yarn, and then some major adjustments to find the ideal size for the shawl. The ideal size proved to be Very Big, which then involved lots of knitting. It's big enough to wrap in front and tie behind which makes it very easy to wear. Because it's light and squashable, but also warm, it's ideal for travelling. Knitting time well-spent. Secondly, the award for my project most favourited on Ravelry goes to the Sempervivum shawl designed by Jared Flood. This shawl has particularly fond associations for me, as the pattern and Loft yarn were a gift from knitting friends when my activities were somewhat limited by a hip replacement early in the year. I suspect part of its 'liking' on Ravelry is due to its being one of my earliest projects for the year, and also to Margarita's great photos of the completed shawl. Thirdly, the award for the most worn project. The Northmavine Hap is a close contender for this category, and probably deserves a special mention as it saved me from freezing when inadvertently caught by a snow storm while transiting through Dallas. But, while I've not been able to count exactly, I suspect the real winner is Georgie Hallam's Little Butterflies cardigan that I made for my grand-daughter. Although Brisbane has mild winters, the difference between day and night-time temperatures can be large, so you need a go-to cardigan most winter evenings. This one has been much-worn and, I hope, much-loved. And finally, the award for the project that was most fun to knit goes to...the Windward scarf I knitted in stripey Noro Seku yarn. What's not to like about this Heidi Kirrmaier project? Stripey yarn knitted up loosely in two-row stripes (you can never have too many stripes). Simple geometric shapes joined together. A straight-forward pattern I'd knitted previously. A lovely combination of colours. Inevitably, thinking about last year's knitting brings thoughts of next year's knitting. Of course I want to be more productive - what knitter doesn't? I think the best way of achieving this is to finish some of the part-completed relatively major projects, so that's my first goal. Then, a practical goal. I want to knit another go-to cardigan for my grand-daughter. And finally, I want to face up to the unadventurousness of my knitting and learn some new techniques and challenge myself. Initially I'll do some colour-work, but over time I'd also like to master some of the wonderful knitting variations such as those described in Britt-Marie Christoffersson's Pop Knitting. Reading over these goals they seem manageable and straight-forward, but they'll require some persistence and dedication. Not qualities that come naturally. It's not the kind of comfort knitting that distracts me so easily. Let's see how I go. I don't usually do 'Christmas knitting'. It always feels a bit awkward to give knitted gifts in an Australian summer. I guess it's a hang-over from childhood when a gift that you had to wait months to enjoy was a great disappointment. But last year (how odd it sees to say 'last year' for something so recent) for a variety of reasons I found myself busily knitting my way through December. There was, of course, the need to make a small hand-crafted Christmas themed gift for an anonymous swap with friends from my Thursday evening knitting group. The last few years we've been indulging in afternoon tea for our get-together and in 2013 we found an ideal venue - the Studio Cafe at the Opera House with its perfectly-framed view of the Harbour Bridge. I knitted two small Christmas angels for the swap. and received two very cute, beautifully knitted owls from Bex in exchange, which I stupidly forgot to photograph before taking them to Brisbane to hang on our family tree. My grand-daughter is a fan of owls, so they were a great hit. My second flurried knitting project was really a finishing project. Some time ago I began knitting a scarf using Martine Biehm's Brickless pattern. At the time I had no recipient in mind other than myself, but it was the kind of project that was ideal for knitting in company; simple enough that it required minimum concentration, but with enough variation to prevent me from becoming bored. I cast on using some beautiful Koigu sock yarn I'd had for several years and had completed about two-thirds of the scarf before I put it aside when I went off on my US and Mexico travels. My daughter had brought her Aestlight scarf with her on our travels. I knitted this for her several years ago and it has been worn and worn. It's knitted from a wool/silk yarn in a neutral but rich pick-grey colour. It's perfect for travel because it's light and squashable, just right for air-conditioned buses and planes, and particularly useful if you're inadvertently caught in an ice-storm. But it's been much-loved and used and is looking rather tatty. I realised that 'Brickless' would be a great replacement. The Koigu 100% wool is made up of many colours, but the overall impression is a mauvey-grey; ideal for wearing with almost anything. I think both this pattern and the Aestlight scarf fall into a category of robust scarves. They're not neat and precious but can be worn with anything and to the most casual of occasions if needed. Most useful. It became part of my daughter's Christmas present and I'm sure will be much used. And finally there was Joshua's blanket. I'd begun a cotton blanket for my grandson who lives in the Philippines in late October in the rather faint hope of being able to send it to Joshua with a friend who was travelling from Brisbane to Manila on 27 December. I decided not to take it with me on my Mexican travels - a decision that had both good and bad outcomes. There's little doubt I would have been able to finish the easy garter-stitch project in my month of travelling. But even in retrospect, the thought of packing and unpacking the increasingly bulky blanket and balls of cotton and squashing them into my luggage is daunting. So, after finishing my other December knitting projects I returned to Joshua's blanket. I knitted on the approach to Christmas. I knitted through Christmas Day and Boxing Day. 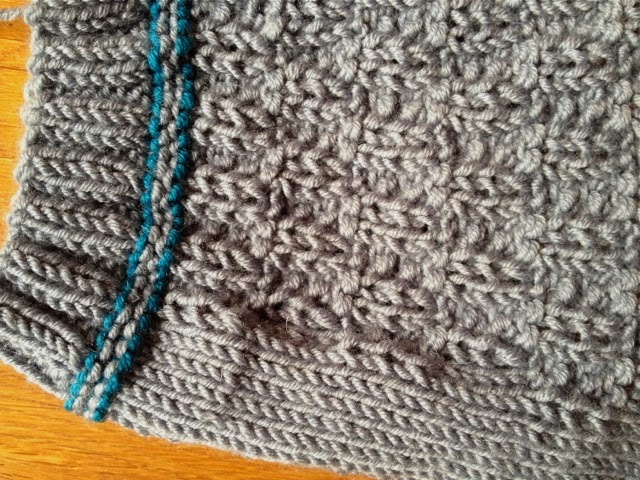 I hurriedly constructed the icord edging. I sewed in the ends on our way to the airport. The blanket was finished just in time, though 'finished' is a rather doubtful description. As I knitted on the blanket I made adjustments to the pattern, with the sections becoming narrower than they should have been, and even omitted altogether. The proportions aren't nearly as pleasing as they were in the original pattern. In the unlikely event that the Mason-Dixon women, whose pattern this is, notice my blanket, I hope they will forgive the liberties I've taken. The blanket is quite small - just under a metre by just over a metre - but it will be fine as a nap blanket in air-conditioning, or as a cover for a sleeping mat on the floor. Anyway, it's done. (I once had a colleague who used to comment 'if a thing's worth doing, it's worth doing badly' - a good adage for the perfectionists among us). My knitting output for 2013 was rather pitiful so it's been good to have a last-minute flurry to make my knitting year look a little more respectable.